Long before the Spanish colonists and, later, the Santa Fe Trail riders, the Pecos people made a home in a valley of buttes ringed by mountains about 17 miles east of present-day Santa Fe. What happened to them over centuries of encounters with other people, combined with cycles of drought, periods of epidemics, and changes in economies typifies two of the most important points learned by teachers participating in a program at the New Mexico History Museum this month. The first is that the disruptions experienced by people across this desert land created wounds that still bear visible scars. The second is that the resilience of those people’s desire to connect their hearts to a physical, geographical place cannot be broken. “Contested Homelands,” a week-long program led by University of New Mexico Professor Rebecca Sanchez and funded by the National Endowment for the Humanities, held two sessions at the museum, reaching a total of 80 teachers. Besides helping teachers from throughout the nation learn how to reorient their notion of how North America was settled, the sessions aimed to put a definition on querencia, a Spanish term that means “home,” but so much more. A place of identity, of heart, and of memory. A place where our stories are told, understood, and embraced. They heard lecturers and panelists, they tried their hands at traditional crafts, they took walking tours of downtown Santa Fe. 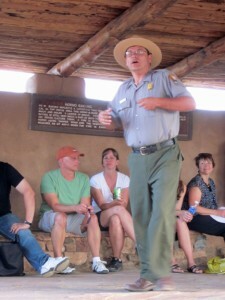 And to wind up their week, they took Friday evening tours of Pecos National Historical Park, guided by History Museum Director Frances Levine, who has conducted extensive research on the pueblo’s ethnohistory and who wrote Our Prayers Are in This Place: Pecos Pueblo Identity over the Centuries (University of New Mexico Press, 1999). 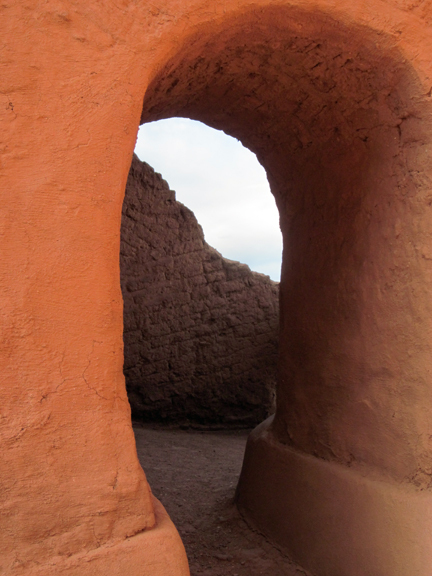 The mission was destroyed in the 1680 Pueblo Revolt, then rebuilt various times over the coming centuries, sometimes with cobblestones, sometimes with adobe bricks. The pueblo’s population fell victim to a variety of stresses — raids by other tribes, smallpox and cholera, drought and starvation. By 1838, fewer than 20 Pecos people lived and were forced to make a difficult choice: Stay in a fragile and lonely land or join forces with the only other pueblo that still spoke their Towa language. 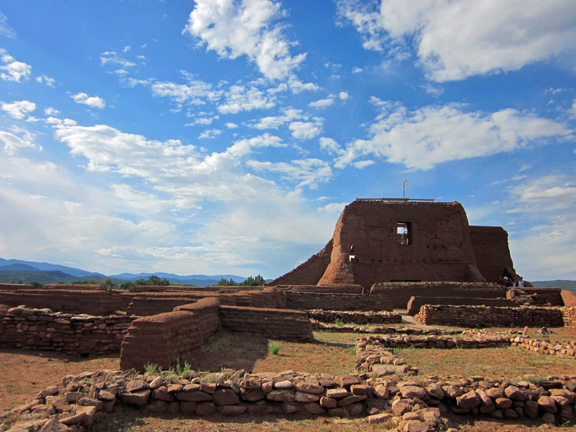 They chose the latter and that year walked the 80 miles west to Jemez Pueblo. Bloodlines have long since mixed, but even today at Jemez, Levine told the teachers, you can find puebloans who nurture a dream of returning to this querencia. Ceremonies are still held at the site, including an annual event with Saint Anthony, patron saint of the mission. In 1999, the skeletal remains of thousands of their ancestors, disinterred by archaeologists and stored for decades at Harvard’s Peabody Museum, were returned to the valley in a ceremony fraught with emotions. After a picnic dinner in a shady grove near the ruins of the mission, the teachers gathered under a ramada to hear Ranger Eric Valencia talk about the resistance, accommodation, and inevitable change that happens whenever people of different cultures encounter one another. What they also heard, though, was Valencia’s version of querencia. He grew up in the Pecos Valley, he told the teachers, and first descended into one of the park’s reconstructed ceremonial kivas as a four-year-old Head Start student. Besides falling into the thrall of the kiva’s mysticism, he said, he was taken by the flat-brimmed hat of the park ranger and knew, even then, that one day he would work there, too.